A couple months ago, when I watched H.G. 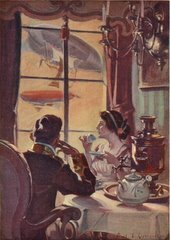 Wells’ Things to Come, it led me to pick up a used copy of The Science Fiction Stories of Rudyard Kipling, which includes two stories about a future world “ruled” by the Aerial Board of Control: With the night mail and As Easy As A.B.C. Kipling’s A.B.C. doesn’t really rule the planet the way Wells’ league of super-scientists, Wings Over the World, does though. The A.B.C. is more like the laissez-faire British Empire, keeping its hands off of things until someone threatens the free flow of (aerial) trade. Suddenly a man among them began to talk. The Mayor had not in the least exaggerated. It appeared that our Planet lay sunk in slavery beneath the heel of the Aerial Board of Control. The orator urged us to arise in our might, burst our prison doors and break our fetters (all his metaphors, by the way, were of the most medieval). Next he demanded that every matter of daily life, including most of the physical functions, should be submitted for decision at any time of the week, month, or year to, I gathered, anybody who happened to be passing by or residing within a certain radius, and that everybody should forthwith abandon his concerns to settle the matter, first by crowd-making, next by talking to the crowds made, and lastly by describing crosses on pieces of paper, which rubbish should later be counted with certain mystic ceremonies and oaths. Out of this amazing play, he assured us, would automatically arise a higher, nobler, and kinder world, based — he demonstrated this with the awful lucidity of the insane — based on the sanctity of the Crowd and the villainy of the single person. In conclusion, he called loudly upon God to testify to his personal merits and integrity. When the flow ceased, I turned bewildered to Takahira, who was nodding solemnly. Once There was The People — it shall never be again! “We own ourselves,” the non-democrats say. Anyway, I was shocked to come across such a clearly non-Progressive story. It reminded me of Mencius Moldbug and of Bryan’s Caplan’s Myth of the Rational Voter. Before Mencius hijacked my brain, I read another, softer anti-democratic piece, Bryan Caplan’s The Myth of the Rational Voter: Why Democracies Choose Bad Policies. I’ve discussed it before, but in an election year, it all bears repeating. And there’s the fact that I finally got around to reading the book, not just a good summary or two. Caplan’s ideas are fairly straightforward, if controversial. The key is that he has gone to the data — the Survey of Americans and Economists on the Economy. He isn’t just rhapsodizing about political philosophy from his lofty perch. Despite all the jokes about economists, they really do agree on a number of issues — and ordinary folks do not “get” this economic point of view. An important, but subtle, point is that ordinary folks don’t simply make random “mistakes” from an economic perspective. Those would cancel each other out in the aggregate. They make systematic mistakes with systematic biases — against markets, against foreigners, toward making work rather than improving efficiency, and toward pessimism rather than optimism. Your individual vote has a negligible effect on an election. Consider it zero. But your vote does not have a negligible effect on how you feel about yourself. So we all have an incentive to vote for things that feel good, even if they won’t work. We can be rationally irrational. If a policy is bad for the economy, it’s bad for the economy, and if it’s good for the economy, it’s good for the economy, but your one vote, one way or the other, doesn’t change whether that policy get implemented or not. You don’t individually have the power to choose policy for the nation. But you do have the power to vote your heart. I’d like to propose a new research convention. Anytime a writer or blogger talks about what The Right or The Left (or some subset thereof) really wants or means, I’d like them to list their personal anthropological experience with the subjects under consideration. If you’ve got these, I’d like to meet your tribe. Puzzle: If you look at voting behavior, education does little to make people more Democratic or more Republican. So what difference does it make if people acquire more sensible views about policy, if it doesn’t change their vote? What I question is that we should be very interested in the differences between presidential candidates in the first place. In our competitive democracy, the candidates wind up being pretty similar in any case. The real problem of democracy is bipartisan agreement on foolish policies. So how can more reasonable beliefs about policy sway political outcomes? The answer is surprisingly simple. When public opinion gets more reasonable, both parties adjust their positions to avoid giving the competition an edge. For example, the U.S. public is markedly less protectionist than it was in the ’70′s, leading both parties to become markedly less protectionist than they used to be. The identity of the winning party might make a marginal difference; but this difference is muted by the fact that politicians want to get behind whatever happens to be popular. The world is a complex place. Most people are inevitably ignorant about most things, which is why shows like “Are You Smarter than a 5th Grader?” are funny. Politics is no exception. Only 15% of Americans know who Harry Reid (the Senate majority leader) is, for example. [...] Many political scientists think this does not matter because of a phenomenon called the “miracle of aggregation” or, more poetically, the “wisdom of crowds”. If ignorant voters vote randomly, the candidate who wins a majority of well-informed voters will win. The principle yields good results in other fields. On “Who Wants to Be a Millionaire?”, another quiz show, the answer most popular with the studio audience is correct 91% of the time. Financial markets, too, show how a huge number of guesses, aggregated, can value a stock or bond more accurately than any individual expert could. But Mr Caplan says that politics is different because ignorant voters do not vote randomly. If people were merely ignorant about economics, I wouldn’t be worried. After all, if you never studied a subject, we’d expect you just to be agnostic about it. The real problem is that people have strong opinions about economics even though they’ve never studied it — and their strong opinions tend to be the opposite of what you’d learn in an economics class. Example of anti-market bias: The way people react to higher gas prices in the face of natural disasters. When supply goes down in a competitive market, you should expect the price to go up. It’s hardly a sign of “conspiracy” or “gouging,” contrary to much of the public. More importantly, this price rise has large socially beneficial effects: In the short run, it encourages people to cut back on low-value uses of fuel; in the slightly longer-run, it encourages sellers to direct their inventories to the hardest-hit areas; and given a little more time, the price rise encourages additional production until the crisis abates. Example of anti-foreign bias: These days, the best example has to be hysteria about immigration. In essence, trading labor is like trading anything — it’s mutually beneficial for buyer and seller. But public opinion has made immigrants a scapegoat for a long — and often contradictory — list of social ills. We hear simultaneous complaints that immigrants are “taking all our jobs” and “all going on welfare” — well, which is it? Their underlying theory is that economic interaction with foreigners has to have bad consequences, so people eagerly blame foreigners for anything that comes to mind. Furthermore, even if you take some of the complaints about immigration seriously, the subjective reaction is out of proportion to the objective magnitude. George Borjas, an economist famous for emphasizing the costs of immigration, estimates that immigrants have reduced low-skilled Americans’ wages by only 8%. And if that were one’s real complaint, why would you want to deport millions of immigrants, instead of e.g. proposing extra taxes on immigrants to compensate low-skilled Americans? Example of make-work bias: Make-work bias is probably one of the main rationales behind European labor market regulation. Among other things, you have a lot of laws that make it difficult to fire workers, seemingly forgetting that the key to social prosperity is not employment, but production. These laws backfire in other ways – making it hard for employers to fire workers also makes employers reluctant to hire in the first place. But the key point is that labor is a valuable resource — and passing laws that require employers to waste valuable resources makes little sense. Example of pessimistic bias: The example that strikes me more and more as I grow older is the refusal to recognize how much life has improved over the past twenty years. I remember life in the ’80′s — the Internet alone has raised my standard of living in ways I could barely have imagined. But many remain convinced that life is getting worse — and want to “do something” about it. Now Bryan Caplan, an economist at George Mason University, has attracted notice for raising a pointed question: Do voters have any idea what they are doing? In his provocative new book, “The Myth of the Rational Voter: Why Democracies Choose Bad Policies,” Caplan argues that “voters are worse than ignorant; they are, in a word, irrational — and vote accordingly.” Caplan’s complaint is not that special-interest groups might subvert the will of the people, or that government might ignore the will of the people. He objects to the will of the people itself. In defending democracy, theorists of public choice sometimes invoke what they call “the miracle of aggregation.” It might seem obvious that few voters fully understand the intricacies of, say, single-payer universal health care. (I certainly don’t.) But imagine, Caplan writes, that just 1 percent of voters are fully informed and the other 99 percent are so ignorant that they vote at random. In a campaign between two candidates, one of whom has an excellent health care plan and the other a horrible plan, the candidates evenly split the ignorant voters’ ballots. Since all the well-informed voters opt for the candidate with the good health care plan, she wins. Thus, even in a democracy composed almost exclusively of the ignorant, we achieve first-rate health care. The hitch, as Caplan points out, is that this miracle of aggregation works only if the errors are random. When that’s the case, the thousands of ill-informed votes in favor of the bad health plan are canceled out by thousands of equally ignorant votes in favor of the good plan. But Caplan argues that in the real world, voters make systematic mistakes about economic policy — and probably other policy issues too. Caplan’s own evidence for the systematic folly of voters comes from a 1996 survey comparing the views of Ph.D. economists and the general public. To the exasperation of the libertarian-minded Caplan, most Americans do not think like economists. They are biased against free markets and against trade with foreigners. Absurdly, they think that the American economy is being hurt by too much spending on foreign aid; they also exaggerate the potential economic harms of immigration. In a similar vein, Scott L. Althaus, a University of Illinois political scientist, finds that if the public were better informed, it would overcome its ingrained biases and make different political decisions. According to his studies, such a public would be more progressive on social issues like abortion and gay rights, more ideologically conservative in preferring markets to government intervention and less isolationist but more dovish in foreign policy. Economists and the public hold radically different beliefs about the economy. Compared to the experts, laymen are much more skeptical of markets, especially international and labor markets, and much more pessimistic about the past, present, and future of the economy. When laymen see business conspiracies, economists see supply-and-demand. When laymen see ruinous competition from foreigners, economists see the wonder of comparative advantage. When laymen see dangerous downsizing, economists see wealth-enhancing reallocation of labor. When laymen see decline, economists see progress. Democracy is a popularity contest. If the average voter believes that less immigration is best for society, democracy rewards politicians who oppose immigration. This does not necessarily mean that elected officials cynically pander to the prejudices of the public. Our leaders might have gotten to the top of the political game because they sincerely share popular prejudices. Regardless of what is going on in politicians’ hearts and minds, though, we can expect democracy to listen to the average voter, even when he is wrong. The empirical evidence indicates that he often is. How are such misconceptions possible, and how can the public keep making the same mistakes, year after year, from the time of Adam Smith to today? You should probably read the whole article.